Keeping the pipeline full of new projects is critical for public relations agencies and even internal teams. Beyond the bottom-line implications, a flow of fresh assignments is important for ensuring career growth for all staff, and it’s often a great team-builder. Whether the project is an extension of current work or something entirely new, it’s critical for the whole group to get behind winning the work and servicing it. An agency’s record in winning new business is also instructive. We’ve done some analysis of our own and have devised the following “post-pitch” questions to ask in order to ensure that the next new business effort is a success. Did you vet the opportunity? New business is exciting, and it’s tempting to swing at any respectable-sounding client or project. 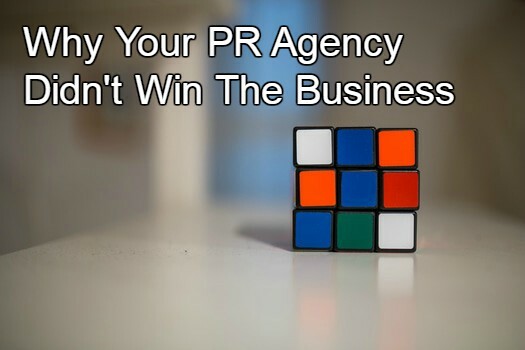 But as many experienced agency professionals know, a portion of new business inquiries are likely to be a poor fit. There’s no shame in losing a competitive pitch, and there are often plenty of reasons to participate in an agency shoot-out even when the odds are long, but every agency team should learn to weed out the non-opportunities. Though a PR team’s needs and queries may vary from those of other types of marketing partners, you can learn a great deal by thoroughly vetting the prospect with specific questions designed to elicit their true commitment to bringing on a new team. Did you research it as thoroughly as possible? Avoid second-guessing by making a thorough list of key questions at the outset. If you have existing business in the same sector, it helps to refer to previous research, but don’t assume your knowledge is current or that the situations are identical. At times teams avoid asking questions once they’ve made significant strides on the pitch and the deadline is looming, often for fear of hearing something that could derail the pitch. Don’t let the process hang you up – ask as many questions as you need to get the fullest picture as you go in. We’ve seen teams fail because important information “popped up” during the pitch and the group was forced to scramble to modify their approach. Was budget covered in advance? It’s always tricky when the company you’re pitching claims to have no budget in mind. Rather than guess, try to ask questions that will draw out this information, like past PR budgets or a realistic range. Perhaps they can share a campaign they admired for a competitor and you can do some sleuthing to determine associated costs. Some agencies won’t pursue a new project without budget parameters, and that’s understandable, but the decision is an individual one. Anything that can make your team smarter about budget will help you to design the best proposal and control the surprise factor on both sides. Do you have access to actual decision-makers? We’ve covered this issue before, but nothing is more frustrating than a new business briefing conducted by a very junior person who isn’t in a position to offer insights about strategic direction or business goals. It’s best to have conversations that include as many process participants as possible, or die trying! Potential business partners can create a much better atmosphere for all the teams involved if everyone has the most accurate and telling information about the assignment. Also make sure to learn as much about the decision-makers in advance as you can. Social stalking is perfectly permissible. Did you put together the best team? By “best,” we mean most qualified in terms of category experience, a good mix of age and gender and those who can sell the company genuinely and enthusiastically. Personality and chemistry still go a long way towards creating successful business partnerships. This article drives home the importance of finding the sweet spot of “competency plus chemistry” in making a relationship work. It’s a worthy exercise to “test” some participants before deciding on a final team, based on the personality mix. Did you ask for a debrief? Critically important if you feel that you struck all the right chords on the above. Encourage an honest discussion with the prospect so you can learn what worked and what didn’t. Often it’s elusive, with vague references to chemistry, or out of your hands (“our CEO had a prior relationship with another team.”) But it can be very constructive to hear a frank critique that includes actual areas where a team can improve. Look at these discussions as ways to provide worthy criticism to the team and fire them up for the next opportunity.